To add live chat to website, you need to make just three simple following steps. First, download Live Chat, then upload your installation to the directory in WordPress (Admin Panel – Plugins – Add New). Click the button “Install” and wait until it has been completed. After this you can use your Live Chat (on admin panel you will have a new menu item “Live Chat by Supsystic”). After purchasing, you will find your unique link in personal account of the site. Your task is to download an archive file live_chat_pro.zip in the directory Plugins. After installation and activation of your plugin, you need to enter the unique license key (which you have in your personal account). Finish installation of your PRO version by clicking “Check”. How can the PRO version of Live Chat by Supsystic help you? The main reason for installation PRO version – better statistic. It helps you to range your statistics by Day, Week, Hour or Month. Look at your messages statistics and see the diagram graphic. Check your agent session statistics, message activity and rating. At last but not the least you can export and save all statistics as CSV file. Live Chat has an additional option: you can add any of your WordPress users as an agent. Just select your user and activate the button “Live Chat Agent” on User Profile screen. 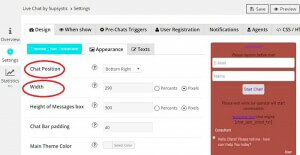 You can customize the design of your own Live Chat. Choose the color, width, length and even the text. Choose options Chat Position, Width, Main theme Color, etc. On the “Texts” tab you can write your personal Chat Bar Title text, “Send Message” Button text, etc. If you don’t want to create something unique and want a quick result, just click the white button “Choose Chat Template” and find the best option for you. When you did everything, don’t forget to click “Save” button! Check more information about Design options. NB! If you are good at CSS or HTML Code you can customize your Chat Box in the corresponding tab in admin panel (Settings – CSS/HTML Code). The result of your coding you can see below the code boxes. You can see more details in this article. Lice Chat by Supsystic allows you to set timeline for your chat box. In addition, it allows showing box on some devices, just for some IPs, Countries or Languages. If you don’t understand something – move your cursor on Question mark. Check more information about Displaying options. Don’t forget to click “Save” button. To read about conditions or options that you can choose by adding Trigger click here. If you want to get some notifications when your chat has been opened, you can choose the options Sound Notification and Auto-update Dashboard there. By the way, you can select a sound for your notification there. You can view all Notification options simply check this page. Live Chat by Supsystic has an additional option for its users – Dashboard, where you can find all the statistics. 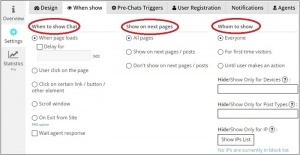 Just select the “Live Chat Dashboard” tab on the admin panel of WordPress and check it. To see more information about Live Chat Dashboard you can click here. There is a statistics page in the general directory “Live Chat by Supsystic”. Read about Live Chat Statistics.